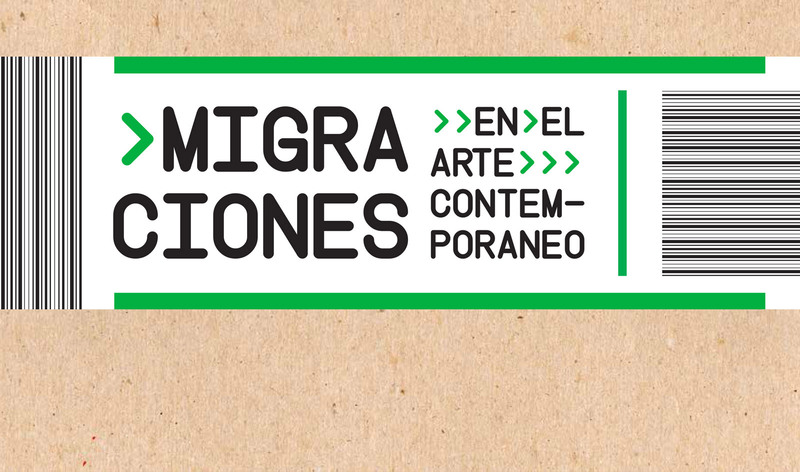 “Migraciones (en el) arte contemporaneo / Migrations (in) Contemporary Art.” Centro de Arte Contemporáneo. Museo de la Universidad Nacional Tres de Febrero (MUNTREF), Centro de Arte Contemporaneo, Hotel de Inmigrantes. October 1, 2015 – December 31, 2015. Currently online as a virtual exhibition. Fig. 1: Exterior façade and entrance display for the Migraciones (en el) arte contemporaneo show at the Museo de la Universidad Nacional Tres de Febrero (MUNTREF) Centro de Arte Contemporáneo, located at the site of the former Hotel de Inmigrantes, Buenos Aires, 2015. Photograph courtesy of Caroline “Olivia” Wolf. A recent exhibit organized in the heart of Buenos Aires, Migraciones (en el) arte contemporaneo boldly tangles with discourses of immigration via contemporary art. The show, curated by Diana Wechsler with the support of MUNTREF Rector Aníbal Jozami, brought together an oeuvre of twenty-two artists from over a dozen countries. These works engage intimately with issues of identity, itinerancy, alienation, and belonging in mediums ranging from found objects and photography to video and sound installations. Emerging amidst the Syrian refugee crisis, the exhibit can be seen as one of a series of curatorial efforts tackling the topic of border crossings throughout Latin America in 2015. While the physical manifestation of the show closed on December 31, 2015, it remains viewable online today as part of a thoroughly documented virtual exhibition. The exhibit must be understood as holding particular resonance in Argentina, a country historically recognized for its open-door immigration policies during key moments of mass migration. The national identities of the show’s artists are difficult to pin down. Latin America was strongly represented throughout the exhibit, from the southern cone and up through Central America. Yet overall, the twenty-two contributors hailed from nations as diverse as Algiers, Britain, Cameroon, the Czech Republic, France, Poland and Palestine. Artists included Leila Alaoui, Hugo Aveta, Claudia Casarino, Fouad Elkoury, Harun Farocki, Gülsün Karamustafa, Zineb Sedira, and Bathelemy Toguo, among others. (A full list of participating artists can be found here.) Like the subjects of their work, these artists constantly cross borders, whether as the holders of multiple legal nationalities, or due to their frequent movements across the international art spheres in which they create and display their works. The perils that such border crossings sometimes entail was recently highlighted by the loss of participating artist, Leila Alaoui, who died shortly after the close of the MUNTREF exhibit in attacks in Burkina Faso while working on a photography project for Amnesty International. In a press release from the exhibition’s inauguration, curator Diana Wechsler shared that the exhibit has been in MUNTREF’s plans since the institution was first created, noting that it closely resonates with current headlines regarding refugees and immigration. Her comment was a nod to the historic charge of the physical location of the contemporary art center within the Hotel de Inmigrantes, the nationally sponsored immigration complex, built at the turn of the twentieth century to document and lodge immigrants during the apex of mass migration to Argentina. Indeed, the building that houses the museum falls within a larger network of structures that still function today as the Dirección Nacional de Migraciónes. The galleries displaying the exhibit originally served as mass dormitories for immigrants– a fact highlighted in the neighboring displays of the Museo de la Inmigración, located down the hall of the same building. As Aníbal Jozami declared during the exhibit’s inauguration, both MUNTREF and the Universidad Nacional Tres de Febrero hold a longstanding commitment to immigration advocacy. Previous shows, such as the 2012 site-specific “Migrants” installation by French artist Christian Boltanski with which the center first opened its doors, have consistently highlighted the issue of immigration. The organizational ethos of the exhibition can be seen as strongly shaped by the potent legacy of immigration to Argentina, as well as the contemporary salience of the issue. courtesy of Caroline “Olivia” Wolf. As viewers moved through the exhibition space, they encountered a series of cordoned-off auditory and visual zones. In the southernmost gallery, Zineb Sedira’s video triptych, “Mother Tongue,” powerfully calls viewers to reflect on barriers of language within diverse generations of an immigrant family, highlighting the distance and discomfort inherent in gaps surrounding the linguistic and lived experiences of its members. 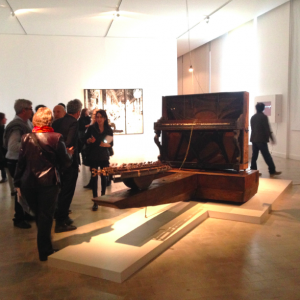 At the center of the same gallery, Hugo Aveta’s installation featured an antique piano brought by an Italian immigrant, intervened by internally altering its keys and externally placing it on a rocking platform to evoke the sound of the sea. Together, the works aurally underscore notions of distance and journeys undertaken, suggestive of migrant crossings. The flanking galleries display photographs as well as object-based and film installations. The implicit inaccessibility and violence of border crossings in its various forms resonates strongly here, as with Claudia Caserino’s 2008 piece, Uniforme, stressing the socio-economic barriers faced by migrants. Nearby, Sigalit Landau’s Barbed Hula video documents the physical scarring produced by the artist’s performance of a hula dance with a hoop of barbed wire– a visual commentary on the desensitization of contemporary society to state-sponsored migrant oppression. Fig. 3: Barthélémy Toguo, Climbing Down, 2015, Bunks, hand ladders, multi-colored bags, activated by students from the UNTREF Circus arts program. 500 x 180 x 100 cm. 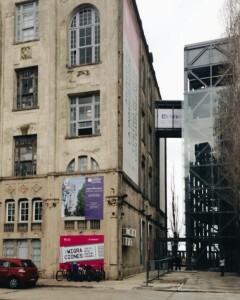 (MUNTREF), Centro de Arte Contemporáneo, located at the site of the former Hotel de Inmigrantes, Buenos Aires, 2015. Photograph courtesy of Caroline “Olivia” Wolf. As the backdrop of the exhibit’s inaugural ceremony in the central hall uniting all MUNTREF galleries, the work of Cameroon artist Barthélémy Toguo garnered particular attention. 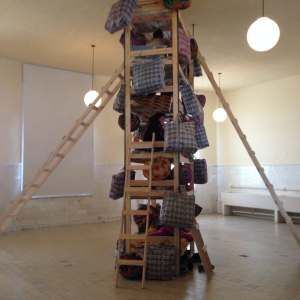 Titled, “Climbing Down,” the piece invited the collaboration of students from the Universidad Nacional Tres de Febrero’s Circus Arts program, who interacted within a towering wooden-frame bunk beds decorated with bundles of traditional African cloth, representative of the personal belongings of immigrants. The work was intended to reflect the precarious reality of life for African migrants in Paris today. The active response of artists to the current migrant crisis made visible via the exhibition demonstrates an awareness that, as W.J.T Mitchell has vocalized, “The problem of immigration is structurally and necessarily bound up with images.” The unique vision of each artist was highlighted in a public conversation led by curator Diana Wechsler, and also carefully documented in a catalogue, featuring curatorial texts and artist’ statements. By thoughtfully bringing together international artists dynamically addressing and engaging with border crossings, the show invites viewers not only to reflect on current political events, but also to reconsider art and its emergent “movements”—be they migrations in ideology, identity, or new forms of visual culture. For online exhibition, see http://untref.edu.ar/muntref/recorridos/migraciones/. Consulted March 15, 2015. “Arte Migrante: En el MUNTREF Centro De Arte Contemporáneo Inauguró La Muestra Migraciones (en el) Arte Contemporáneo con una gran convocatoria de public,” Universidad Tres de Febrero, October 2, 2015. W.J.T Mitchell, in Saloni Mathur (ed. ), The Migrant’s Time: Rethinking Art History and Diaspora, Sterling and Francine Clark Art Institute, Yale University Press (New Haven and London), 59. For catalogue, see Diana Weschler, Migraciones (en el) arte contemporaneo, Saenz Peña: Universidad Nacional Tres de Febrero, 2015.